The National Finals competition is always a night to remember as contestants from across the nation come together for an incredible evening of inspiration, glamour and personal accomplishment. 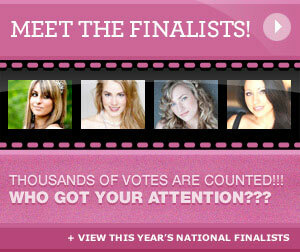 Over 60 finalists compete for the Title in the summer in the city of Toronto , each delegate has been carefully selected through a Miss Teenage Canada provincial pageant competition that awarded them a regional title to rein for one year from the time of their crowning. 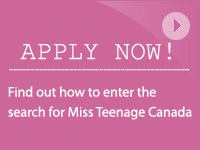 Being awarded the title of Miss Teenage Canada is an incredible honour— and one that comes with a stunning array of opportunities. 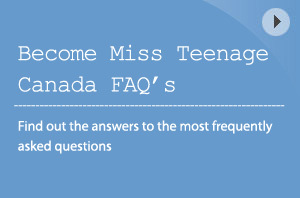 Miss Teenage Canada will have the opportunity to make high profile public appearances, be interviewed by local, provincial and national media, attend gala fundraising events and use her influence to inspire others and give generously to wonderful charitable organizations such as Free the Children. The national title winner not only represents her region but all of Canada for one year—until she crowns her successor. Contestants will be judged on personal interview, evening gown, swimwear, charity contribution, public speaking, community engagement and photogenic appeal. There are also optional categories like the talent competition and the written essay that create opportunities for learning and discovery, fun, friendship—free from the pressure to win and without bearing on who wins the title. It truly is a once in a lifetime opportunity for personal growth, self discovery and transformation.